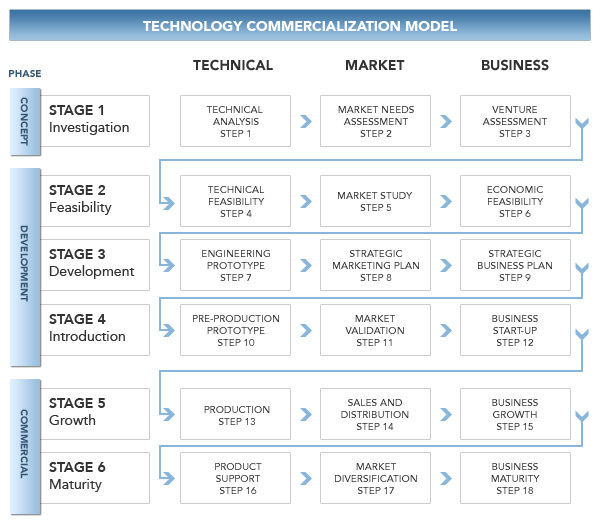 Using a product development and technology commercialization model provides a "road map" to commercialize technologies and products. Using such a model helps to break the process down into a sequence of major phases, stages, and critical steps and activities that should assist with, and increase the likelihood of success. Each phase has specific technical, marketing and business activities that must be considered as the planning moves through each step of the process. A product development and technology commercialization model also serves as a framework to develop progress measures, to identify information and technical assistance needs, to estimate development costs, and to forecast financing requirements. To achieve results an implementation strategy is critical, which are governed, more or less, by specific goals and environment of the firm, and the technology being developed. See "Related Documents" on this page to download Implementation Strategies (.doc) for some different strategic implementation approaches that can be used. Imagine the success that can be achieved if a properly executed technology and product commercialization process was implemented? 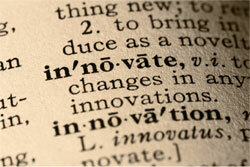 Many companies have yet to even scratch the surface of the high technology commercialization performance. Agreeably, successful implementation of the technology commercialization process is a significant challenge, but, if done properly, sustainable and significant results can be achieved.